I believe that it’s because most humans fear the unknown. Change jeopardizes daily routines, modifies inter-personal relationships, and – most of all – forces us to deal with the unknown. From my point of view, one of the best books on dealing with change is Who Moved My Cheese? which tells the story of four creatures in a maze and how they react when their routine is changed (i.e., their cheese is moved). The book makes the case that change itself is neither good nor bad; it has always happened and you should expect that it always will happen.The only real danger is ignoring change. If you do so, you will eventually run out of cheese. I’ve previously argued that the sudden change of big bang performance management won’t shock the proverbial frog into jumping out of the pot. Instead, sustainable performance improvements coming from changing behaviors and Grinch-like heart growth. Place ten monkeys in a cage. Hang a banana on a string out of their reach and place a set of stairs under it. As soon as any one of the monkeys tries to climb the stairs to get the banana, spray all of monkey with cold water. The monkey will immediately stop climbing the stairs. Whenever a monkey tries to get the banana, repeat this same process. Pretty soon, none of the monkeys will try to climb the stairs. This is classic Skinner negative reinforcement. Now, replace one of the monkeys with one that has never been in the cage. This new monkey will likely try to climb the stairs to get the banana. However, the other monkeys will stop him – they don’t want to get sprayed with the water. Next, replace another of the original ten monkeys. The new monkey tries to get the banana but the others won’t let him. Even the first newcomer tries to stop him, even though that monkey doesn’t know about the cold water. Keep replacing the original monkeys with new ones, one at a time. Every time the newest monkey tries to climb the stairs, the other monkeys stop him. After a while, most of the monkeys have no idea why they shouldn’t climb the stairs but the group refuses to allow anyone to do it. After replacing all the original monkeys, none of the monkeys have ever been sprayed with cold water. Regardless, no monkey ever again approaches the stairs to try for the banana. Why not? Because, as far as they know, that’s the way it’s always been done. It’s institutional memory at work. I doubt that this experiment is factual and, if it is, it’s probably not an ethical way to treat monkeys. In addition, humans are not the same as monkeys; reasoned arguments can influence behavior even when the wisdom of the crowds suggests otherwise. Regardless, the experiment is a vivid reminder of organizational inertia and can explain why it’s hard to introduce change to large groups. If it was your job to discover new ways to get the bananas, what would you do? The wordpress “possibly related posts” is a great discovery tool. I’d never heard of the experiment before and it pointed me to three other blogs that quote a similar version. To answer your question, I would climb the cage. It surprised me that the story said the monkeys went to climb the stairs. For a monkey, I would not think that would be the response for it is a human thing to climb stairs. Monkeys climb things yes, but they would also utilize the cage, ropes, vines, trees and such. I work in a large company in a manufacturing plant, and I understand fully the concepts you speak to and about. I am not of that mindset. I tend to be the ball in the room full of squares, and at times I can look like a square. I find that the majority of the people I work with are basic and simple people. Thus it takes the base and simplicities of life to reach and speak to them. What I mean by this is you can take a rock, and you can dress it and make it look like a baby. All they will see is the base and simple thing looking like something it is not for they see the rock. Unless it is true and real to them, you will not reach them and really grab the change. You catch a handful of workers with truth and real good positive change, you will get the whole plant. If you put false information in it from the top, you will lose all the momentum, and you will have to work twice as hard. People have to have something to look forward to, and they need positive feed back. Those two things will get you good morale and loyalty for a long time, and paves the road for any change that is necessary. Otherwise, you will have to trail blaze your own ever changing road to change all by yourself. great experiment … in my experience we always forget the reward/punishment element in change management. Culture in companies, is, imho, based on the institutional memory of punishment and reward (just like you described in your experiment) and if we want to change behaviour, we have change the reward and punishment parameters in a visible way. Bananas for monkeys it is easy goal! Let think about the difficulty around change management when you have to convice/seduce/motivate a group of people to achieve something that is not familiar nor desirable as the bananas for monkeys. 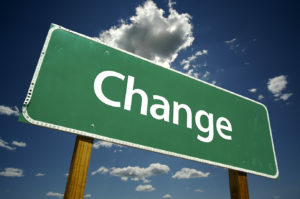 In my opinion, one of the most diffcult tasks about change manangement is to unify the criteria in a group of people for doing something together to achieve a common goal that, sometimes, is not completely understood or signed off by all parties, but still equally important and heavily dependant on everyone’s effort. In the monkeys experiment, even before they start thinking about climbing the stair for the first time to grab the new “goal”, without a unified criteria on how to do it and a clear definition about why that is important, they will spend days, or years, debating about who should go first, if they have to go in pairs, if the really need to get that “thing” to survive and if the stair is the best way to achieve it, etc., etc.